A New Year’s card with greetings in four languages of the North Azov Greek community: Urum, Rumeika, Modern Greek, and Ukrainian. Source: Athena Khadzhynova. Today’s recipe comes to us from the shores of the Azov Sea region in Ukraine, where waves of Greek migrants settled over the centuries, starting in ancient times. The North Azovian Greek community celebrates New Year’s Day, or Kalanda (Каланда), with traditions familiar throughout the broader Hellenic diaspora. In many North Azovian Greek villages, khurube (хурубе, or kουραμπιέδες) are prepared for New Year’s as well as other festive occasions. Children roam from home to home singing kalanta, or New Year’s carols, and collecting coins from family members and neighbors. A pomegranate is smashed on the threshold of the family home for good luck. And just as in other communities throughout the Hellenic world, the New Year’s holiday is celebrated with a festive pie or pita. 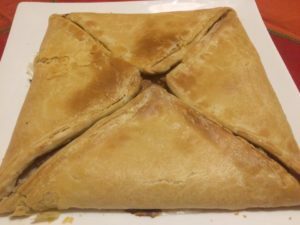 In North Azovian Greek villages like Sartana, where the following recipe originates, this unique New Year’s pie is called Kalandeshu shmush (Каландешу шмуш), and is filled with a mix of ground meat and pumpkin. With the whole family present, the shmush is sliced in order: the first slice for Saint Basil, the second for the family home, and the remaining slices for the members of the family, from oldest to youngest. Preheat oven to 390 degrees F/200 degrees C.
Start by preparing the dough. Add flour to a large bowl and make a well. Pour the vegetable oil and egg into the well. Dissolve the salt and sugar in water, and combine with the flour mixture, adding water as needed until a firm dough forms. Cover the bowl with a dish towel and allow the dough to rest while you prepare the filling. Brown the meat. Add salt and pepper to taste. Add the grated onion and combine well. Add sugar to the grated pumpkin, if desired. Do not combine the meat and grated pumpkin until just before you are ready to bake the shmush. Divide the dough into three pieces. Roll the dough into thin discs, no more than 50 centimeters wide. Melt the lard or mix of margarine/butter. It should be warm, but not hot. Dip the first disc in the shortening, and ensure that it is evenly greased, with no pools of grease on the dough. Grease and layer the second and third discs on top of the first. Starting with the side closest to you, fold over ⅓ of the dough into the middle, leaving ⅓ open. Fold over the far third of the dough onto the first fold you created. Continue to fold over in thirds, moving from left to right and from right to left, until you have a small square. Let rest, covered, for 10 minutes. Combine the pumpkin with the ground meat. Roll out the dough into a wide, thin square. 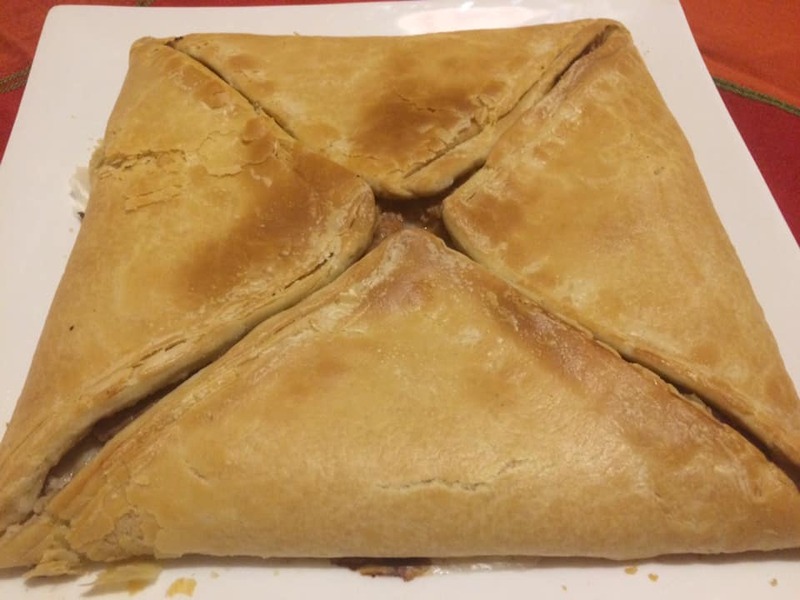 Before adding the pumpkin and meat filling, bring the four corners of the square into the center. Transfer to a greased baking pan. Unfold the corners. The creases create the boundary for spreading the filling. Spread the filling evenly over the boundary. Fold the corners back over the filling and pinch the edges together neatly. It will look like an envelope. Brush the top of the shmush with the sour cream, kefir or egg. Bake in a preheated oven for 40-50 minutes until golden. 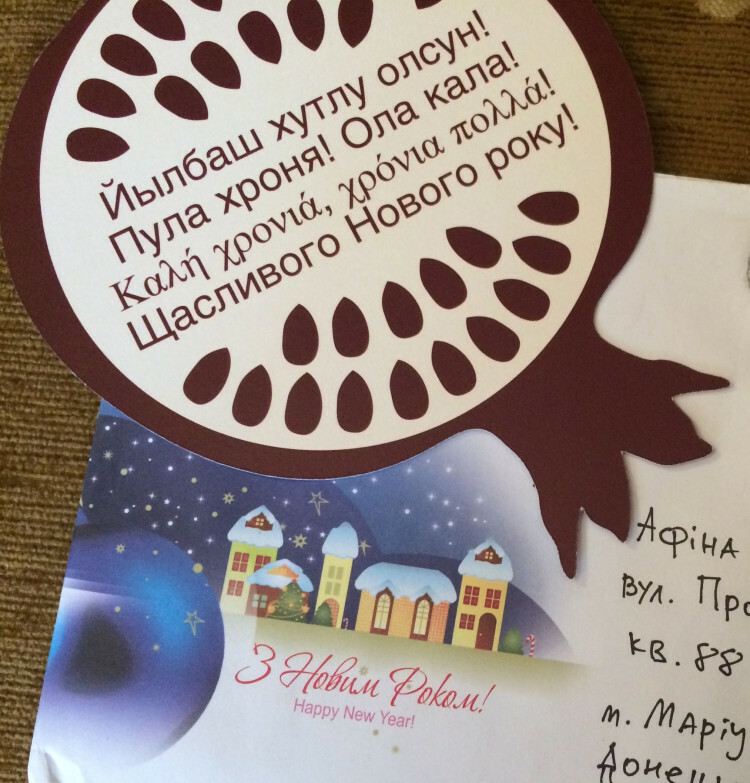 Read more about North Azovian Greek New Year’s traditions (in Ukrainian) here.